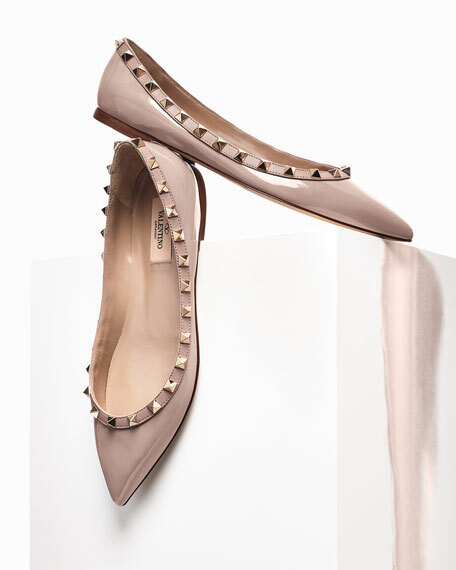 Valentino Garavani re-envisions the basic ballerina flat in high-gloss leather and collection signature studs. Valentino Garavani patent leather ballerina flat. Signature platino Rockstuds on matte leather trim. Christian Louboutin floral-printed satin ballet flats. Flat heel. Round toe with grosgrain bow. Scrunched elastic collar. Slip-on style. Signature red leather sole. Made in Italy. Cole Haan stretchy leather ballerina flat with pilgrim buckle and bow. Cushioned with GRAND.OS technology for ultimate comfort. 0.5" flat heel. Round toe. Scrunched collar. Slip-on style. Manmade lining. Padded footbed. Rubber outsole. "Emory" is imported. Cole Haan "Tali" ballerina flats, updated with logo-plaque bow detail. Grand.OS?? technology for lightweight comfort, flexibility, and responsive cushioning. Elastic collar for scrunched fit. Round toe. Quilted footbed. Genevieve weave rubber outsole. Leather lining. Slip-on style. Imported.